The audacious attack on the battleship Royal Oak by U-47 at the base at Scapa Flow in October 1939 has to go down as one of the legendary stories in naval history, both for the significance of the events and the way in which the feat was accomplished. The raid on Scapa Flow was one of those moments that will always be highlighted in the annals of warfare, a testament to the skill, craft and bravery of all of those involved. The raid was one of the defining moments of the war, in that it shook to British high command into realising that they were not so invincible after all - which in turn was to lead to the beginning of a more concerted effort to combat the U-boat threat. Located on the Orkney Islands north of Scotland, Scapa Flow was the main fleet anchorage of the Royal Navy and had been seen by most as something of an impregnable fortress, particularly against submarine attack. Indeed, there had only been two previous attempts by German submarines to make its way into the British base: U-18 had penetrated in 1914, and in October 1918 Oberleutnant Joachim Emsmann's UB-116 lost all hands after striking a mine. The Flow had not been used as a base between in the wars, with the defensive mines being exploded in 1919; the last ship from the Home Fleet to lower its flag left the following year. However by the late 1930s and the reemergence of German naval power, Scapa Flow was given a new lease of life. However, the idea that the base was impregnable was not shared by the Admiral Sir Charles Forbes, who in 1938 had carried out an inspection of the defences. There and then Forbes himself purchased a large concrete barge for 100 to serve as an additional blockship, but his recommendations for securing the defensive loopholes that remained went unheeded. Nevertheless, the base was once again to become the home of the Home Fleet in September 1939, something that was confirmed with Churchill being appointed First Lord of the Admiralty. Defensive loopholes notwithstanding, any attack on the the base would need nerves of steel and the highest level of skill - to undertake such a task was, in Dönitz' own words, "the boldest of bold enterprises" - for any prospective attacker had to deal with not only the heavy defences, but also the unpredictable currents, powerful enough to carry a U-boat off course and into danger. The U-boat chief set about gathering intelligence on the British anchorage - provided both by aerial photographs supplied by the Luftwaffe and the reports submitted by Kapitänleutnant Wellner, whose U-14 had been patrolling the area between 13 and 29 September as part of an ongoing reconnaisance operation. Wellner had concluded from his mission that a penetration into the Scapa Flow from the Hoxa Sound might have been feasible, but after having studied further aerial reports Dönitz had concluded that such a task was next to impossible. Holm Sound is protected exclusively by two apparently sunken ships lying obliquely in the navigable water of Kirk Sound, together with one ship lying on the north side. South of these obstructions as far as Lamb Holm there is a gap, 170 metres wide, 7 metres in depth up to the shallow water. Also north of the sunken ships there is a small gap. the shore on both sides is practically uninhabited. I hold that a penetration at this point on the surface at the turn of the tide would be possible without further ceremony. The main difficulty concerns navigation. On this [intelligence] I decided to allow an attempt to be made. My choice fell upon Lieutenant-Commander Prien, the captain of U-47. He, in my opinion, possessed all the personal qualities and the professional ability required. I handed over to him the whole file on the subject and left him free to accept the task or not, as he saw fit. The initial meeting had taken place on 1 October, and had been a complete surprise to Prien - the last thing one expected on a Sunday afternoon was to have your after-lunch chit-chat in the Officer's Mess interrupted by a command to present oneself to the office of the commander in chief. Indeed, Prien had been convinced that he and the other two men who were summoned to Dönitz's office, flotilla commander Sobe and Leutnant Wellner, were going to be given a dressing down for something or another. All three men made their way to Dönitz's office aboard the Weichsel without exchanging a word. Prien was the last to be called in, and on entering the office saw the other two men standing alongside the Commodore. After the salute and a quick introduction, Dönitz handed over to Leutnant Wellner, who began to talk about the Orkneys. Prien was also able to see maps on the table clearly marked "Scapa Flow". His heart skipped a beat; some dressing down this was going to be. I felt a tremendous tension within me. Would it be possible to bring it off? My common sense calculated and questioned the chances, but by will had already decided that it could be brought off. At home, supper was already on the table. Absentmindedly I greeted my wife and child, for my thoughts were obsessed with the single idea of Scapa Flow. After spending the evening scrutinising the reports he had been given, the U-boat commander was confident that the task could be undertaken successfully, although this was tempered by an honest acknowledgement that the task would not be an easy one. He was called into Dönitz's office at 1400 hours on the afternoon of Tuesday 3 October to give his decision. He was asked the simplest of questions - "yes or no?" - to which he replied in the affirmative without hesitation. Even then Dönitz had to make certain, and firmly reiterated the dangers. But by then he knew he had found his man: Prien acknowledged the risks, but was confident that he could succeed. He was ordered to prepare his boat; excess food was to be unloaded, and new electric wakeless torpedoes were to be deployed. These tasks were accomplished between 4 and 6 October, and Prien's colleagues and some members of the crew could sense that something was afoot. On Friday 6 October, following some rather loud banter by U-46's skipper Kapitänleutnant Herbert Sohler about Scapa Flow, Prien called both his 1.WO Engelbert Endrass and Chief Navigator Wilhelm Spahr to his cabin. He informed his two senior men about the assignment, and showed them the plans. The immediate task was to maintain secrecy as much as was humanly possible, and to keep the crew under control. Sohler's joke had been just that, but the fear of having the gossip spread was clearly a cause for concern. The date set what became known as Operation Order North Sea No. 16 was the night of 13/14 October, when both periods of slack water would take place during the hours of darkness. U-47 was set to leave port on the preceding Sunday, 8 October. The selection of the dates was not lost on Endrass - as well as casting off on a Sunday, the mission had been timed for Friday the thirteenth. If anything was to test that age-old superstition, this was going to be it. Adorned with a makeshift conning tower emblem mocking the British Prime Minister Neville Chamberlain and armed with a full complement of the new G7e electric wakeless torpedoes, U-47 gently moved out from its base at Kiel on 8 October. Prien took a carefully-considered route to the Orkneys - lying on the bottom during daytime and keeping radio silence. The mission had been planned with the highest level of security, to the point where Dönitz had transmitted the details to Raeder by word of mouth, and by 4 October all other U-boats operating around the Orkneys had been withdrawn from the area. As Prien and his crew slowly made their way towards their target, it is highly likely those in the higher German chain of command were oblivious to the monumental task that had been set in motion. U-47 prepares to leave Kiel for Scapa Flow. 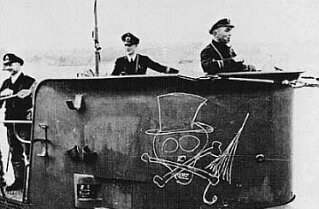 Note the drawing of the skull and crossbones, adorned with the top hat and umbrella that were frequently used as mocking symbols of the then British Prime Minister Neville Chamberlain. The journey to the target area was pretty uneventful, the biggest cause for concern being a number of fishing vessels. At 0445 hours on 12 October after having the boat settle gently on the sea bed south of the Orkney Islands, Prien had all the men gather in the forward post, where he would make the official announcement about the mission. He got to the point quickly, simply announcing in a very clear voice that "this evening we are going to Scapa Flow". The reaction from the crew was one of stone-cold silence; indeed in his memoirs Prien recalled being able to hear the dripping of water on the metal floor. Most of the men had no doubt heard the mess-hall gossip about Scapa Flow, but from the reaction it appeared that they couldn't believe that they were actually going. If the mission was not difficult enough, things were not made any easier when the lubricating oil was found to have 7-8% water in it. A leak in the cylinder liner was found to be the culprit. Chief Engineer Johann-Friedrich Wessels was called up on to apply all of his expertise and experience; Prien knew that anything less than a fully-functional engine that could take the necessary punishment would have jeopardised the mission's success. Wessels' application, professionalism and calm approach put his captain's mind at ease: it was going to be a long night, and everyone was finding it difficult to get much-needed sleep. Every eventuality was taken care of, up to the preparation of explosive charges should the boat need to be scuttled. Three reliable men, Stabsmachinist Gustav Böhm, Obermaschinist Kurt Römer and Ober-Mechanikersgefreiter Kurt Bleek, were assigned with the task of setting off the charges should such an action need to be taken. Charges were set in the control room, engine room and the forward torpedo compartment, popularly known as the "house of lords". By 1915 hours on the evening of Friday 13th everything had been readied for the attack, and U-47 was ordered to surface to periscope depth. Thinking back to the problem with the engine, Prien ordered both of the diesels to be fired up. The starter motors and then the diesel engines coughed into action, and sounded healthy. The skipper congratulated his Chief Engineer on a job well done. Even then there were complications, for as Prien climbed out onto the conning tower his eyes were met by the aurora borealis lighting up the night-time sky. While 2.WO Amelung von Varendorff appeared transfixed by the technicolour wonder, Prien cursed his luck. The preparation had been excellent, but no-one had accounted for the appearance of the Northern Lights and the possibility of the boat's shadow being seen against the reflection of the light on the water. The dilemma was obvious, but Prien had to make up his mind quickly. They would go that night; another twenty-four hours of waiting would have been unbearable, and perhaps he could use the extra light to his advantage. The order was given - "both engines full ahead!" After the crew had enjoyed a hearty meal prepared by ship's cook Friedrich Walz, the U-boat silently made its way up towards the Holm Sound and the smaller and more heavily defended Kirk Sound, through which it would weave its way into Scapa Flow itself.